Getting feedback from you lovely people. 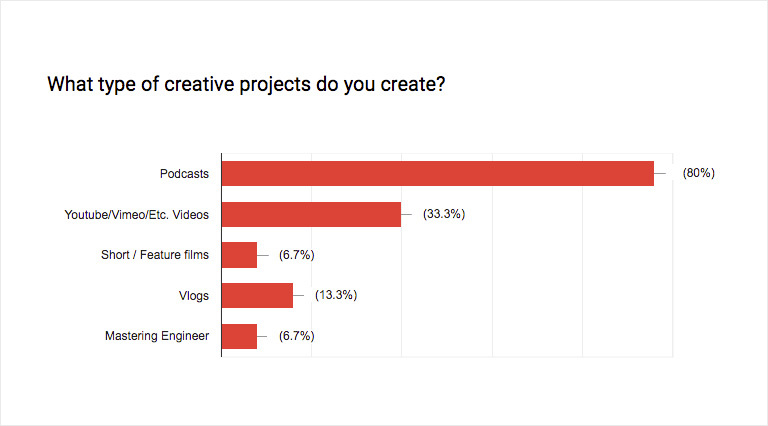 The second most-picked answers to this question were “More community (ways to share rough edits of your projects, discuss how to use music, get support)” and “I want to know more behind the scenes! (Blog posts, vlogs, maybe even a podcast of our own?)”. I’ve started focussing on this blog to get a little more behind-the-scenes on the go – but in the short term I am also going to put a lot of energy into developing the community aspects of this site. More than that very soon! More specifically, more background music! My next question was, what KIND of new music do we want? 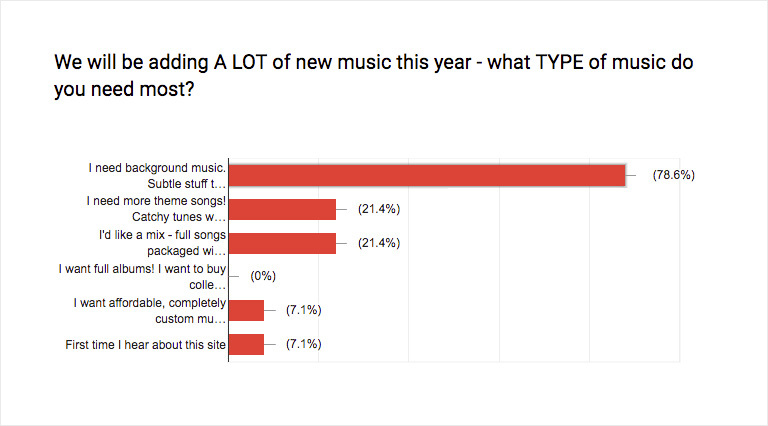 The results were a resounding push toward more background music, music that can be used as an underscore in projects. This doesn’t mean I won’t be making catchy chunes anymore, but I’ll be focussing a little more on getting some backing tracks up on the site this year. I was personally really curious about who was using the site. 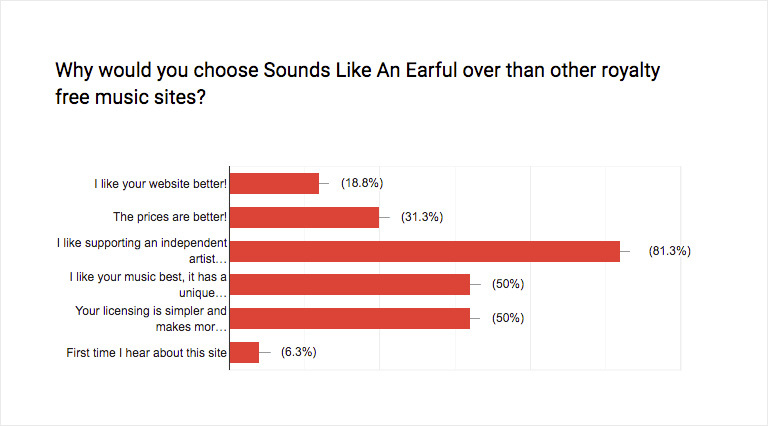 A whopping 80% of you are podcasters. That’s cool to hear, because any of you who know me know that I have a real soft spot for podcasting. Don’t worry video friends, I love ya too. This one made me feel happy. 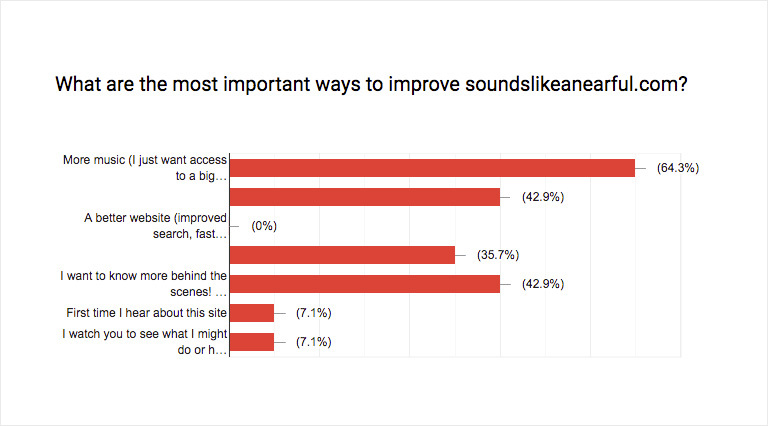 In asking why folks use Sounds Like An Earful instead of some competitors (like Musicbed or AudioJungle) the biggest answer was that people like working with the little guy. That’s very cool. In a world where the indies get overshadowed by big corporate marketing – it’s super nice to hear that a lot of folks still like a little personal touch. Trying to make it easy. I asked you all if there were any specific parts of using the music supply that caused any hiccups for you. 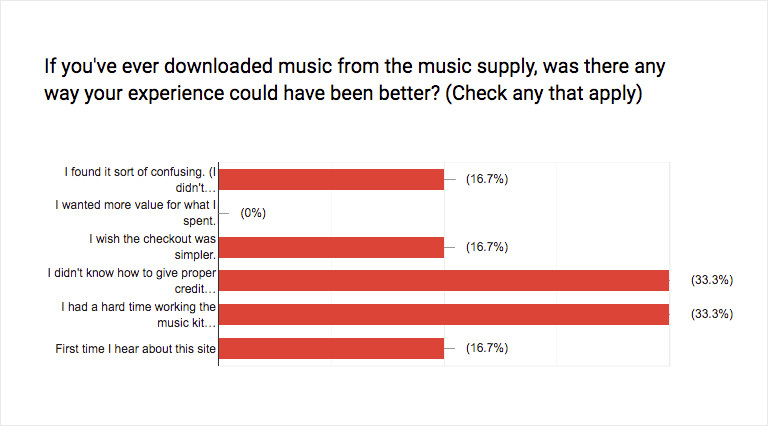 The most popular answers with ‘How do I give proper credit?’ and ‘How do I use the music kits?’. I’m going to get to work on writing tutorials for both of these things – so thanks for that feedback and hang tight, I’m on it. Thanks again one more time to everyone who has helped by answering this year’s survey. Here’s to growing in 2019 and I’ll see you next year for the annual survey 2020!